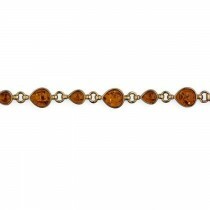 A 9ct gold pear shaped golden Baltic amber bracelet. What is Baltic Amber? Baltic amber is the fossilised resin or sap from extinct prehistoric coniferous pine trees which formed a huge forest 40-60 million years ago at the present location of the Baltic Sea.